It’s always heartening to hear you CAN win a war — especially when the odds are stacked against you. And I say this as an individual who is virulently anti-war in the classical sense of the term. I’m not much for guns and bombs and blood lust. But I do love the notion that you can fight a wrong without shooting — and right it. That’s what the fight has been for Elouise Cobell, a member of the Blackfeet Nation in Montana. Today we can bask in the incipient victory of this stalwart warrior. ‘Course, she may not fit the profile of the movie version. She’s a she. She’s 64. And she’s an accountant. She won by arming herself with nothing more than the truth and the proof of that truth. The truth being the US government’s mismanagement of trust monies owed to about 300-thousand native people. A pot full of money that runs into the billions of dollars. If a bank did what the government did, they would have been put in receivership … They were managing money and lands with no background in money management. In May, the U-S House of Representatives voted in favour of settling that lawsuit, which means Cobell and her fellow complainants could be in for a $3.4 billion dollar resolution. It’s a lot of resolution. Even though it’s only a sliver of the $47 billion they had been seeking. Bitter medicine being what it is, $3.4 billion is easier to swallow than $47 billion. So it may be all over. Except … there’s one final hurdle. The US Senate has to enact the legislation by a June 15 July 9 deadline. It’s been pushed back by virtue of the fact the settlement is attached to a jobs bill which Senate Republicans killed June 24th via filibuster. When that changed, a rookie Senator decided to wade in and press for a cap on lawyer fees being charged for the 14 years it’s taken to to wrangle the settlement in the first place. Cobell says if the terms of the legal fees are tinkered with the whole settlement could fall apart. So once again it’s a waiting game. 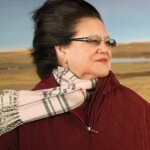 Now, Elouise Cobell is a patient woman. She’s had to deal with slurs about how much the lawyers are going to make on the case – from $50 to $100 million is the figure widely cited. She’s also had to field accusations of playing loose with her own portion of the settlement money. But she hasn’t quit. Some time back, she issued a statement in the hope the U-S Senate would do the right thing. The clock keeps ticking. A lot of people don't know that similar shenanigans went on north of the Canada/U.S. border with moneys that were supposed to be managed “in trust” by the federal government. For example, the Haldimand Grant to the Mohawks and their allies after the the U.S. War of Independence was huge – more than 1-million acres, stretching along the Grand River from Lake Erie north along the watershed, most of the way to the Bruce Peninsula. The Mohawk wanted to invest moneys generated from use of some or much of that land to support future generations. The British administration (later assumed by Canada) said the only way this could be done was to transfer (“surrender”) parcels of land over to the Crown for sale or lease. Funds generated from these sales and leases would be put into a Six Nations revenue (trust) fund to be administered by the Crown. You can probably guess what happened next. Questions were asked by the Mohawks. Assurances given by governing officials. Answers fudged or simply nonexistent. Truth finally came out that the feds could not account for the moneys. What they could account for had been folded into the “General Revenue Fund” – by Canada, via the Indian Act. Today, Six Nations of the Grand River shells out a lot more money in taxes than it receives in grants – and has a huge housing backlog (insufficient funds), massive water problems (insufficient funds), and so on.